In using the heading “Lost & Found” for this post, I don’t mean to suggest a “lost” film in the sense that historians and archivists have come to mean it. I mean a movie that was once readily available — at least on TV, and in my neighborhood, in the days of local stations’ film libraries and syndication packages — but that now seems to have vanished entirely except for the occasional 16mm print or bootleg video. John Farrow’s Night Has a Thousand Eyes is one of those movies. It presumably still exists in the vaults at Universal Pictures (proprietors of Paramount’s pre-1950 library), waiting for the day Universal finds it worth their while to issue a white-market DVD. The day may yet come; the picture does have its following. I tried to bid on a 16mm print on eBay a couple of years ago, but the price quickly went out of my range — and this at a time when 16mm features were hardly moving on eBay at all. Night Has a Thousand Eyes originated as a novel by Cornell Woolrich, one of the more unusual creeps in the history of Hollywood (where creeps have never exactly been an endangered species). Born Cornell George Hopley-Woolrich in 1903, his parents separated when he was little. 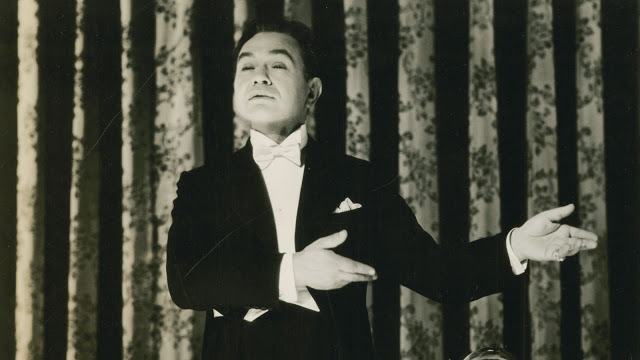 He lived with his father in Mexico until he was 12, then moved to New York to live with his mother — which, except for one brief interval, he did for the rest of her life. He dropped out of Columbia when his first novel Cover Charge promised success as a writer. His first six books were sort of faux Scott Fitzgerald, and while that particular line didn’t pan out, when he turned to crime fiction it was another story. He began writing for the pulp magazines like Black Mask and Dime Detective, cranking out short stories by the fistful — in time over 300 of them — and, later, novels for the same audience. He never got rich at the magazines’ penny-a-word rates, but he wrote fast enough to pay the bills. Before that, his Fitzgeraldesque books had earned him a job in Hollywood writing for First National Pictures — that’s the brief interval I mentioned. Whether anything he wrote made it to the screen is an open question. 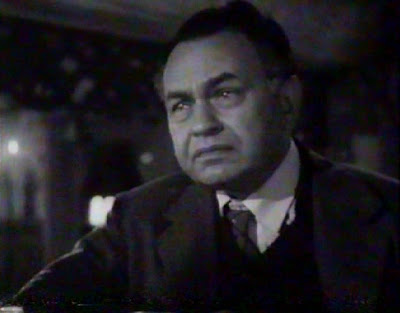 His IMDB page lists several titles, silent and early talkie, on which he was credited as William Irish; on the other hand, in an article for Time Magazine, Richard Corliss says that Irish was another writer at First National whose name Woolrich later appropriated as one of his noms de plume. Another thing Woolrich did in Hollywood was get married, in 1930, to 20-year-old Gloria Violet Virginia Blackton, daughter of silent movie pioneer J. Stuart Blackton. The marriage was never consummated, and Gloria eventually had it annulled in 1933, after Woolrich had gone home to Mother. According to Corliss (who cites Woolrich biographer Francis M. Nevins), when Woolrich moved out on Gloria he left behind a diary for her to read. In it, for starters (says Corliss), he had written that “it might be a really good joke to marry this Gloria Blackton.” The diary also went into “sordid and dreadful detail” about his daily sexual adventures with anonymous men; as Corliss says, while he never consummated his marriage, he was hardly celibate. I say it again, the man was a creep — not because he was gay, but because of the diary, and because he left it behind for Gloria to read. Then there’s the fact that he lived with his mother until he was 53, when she died. By itself that would just be kind of odd; taken with everything else it tends to red-line the creep factor. (It sounds like Sebastian and Violet Venable in Tennessee Williams’s Suddenly, Last Summer.) When his mother died in 1957, Woolrich fell to pieces and wasted away. Literally. He neglected a minor foot infection, dulling the pain with booze, until it became gangrenous and they had to amputate his leg above the knee. When he died, alone and miserable in 1968, he weighed only 89 pounds. The doom-laden fatalism and frustrated self-loathing that lurk under the thin skin of Woolrich’s life surfaced in his writing when he turned from Fitzgerald Jazz Age society to the dank, shadowed recesses of crime fiction. It may not have made him rich or famous, but it kept him eating, and as luck would have it he caught the leading edge of the wave — first of the pulp-fiction detective magazines of the 1930s and ’40s, then of the dark, morally ambiguous movement in 1940s Hollywood that would become known as film noir. There were no fewer than 15 movies made from his novels and stories in the 1940s alone, and dozens more (for theaters and TV) since then. Probably the best of the lot — certainly the most famous — is Alfred Hitchcock’s Rear Window (1954), originally published as “It Had to Be Murder” in Dime Detective Magazine (Feb. ’42). 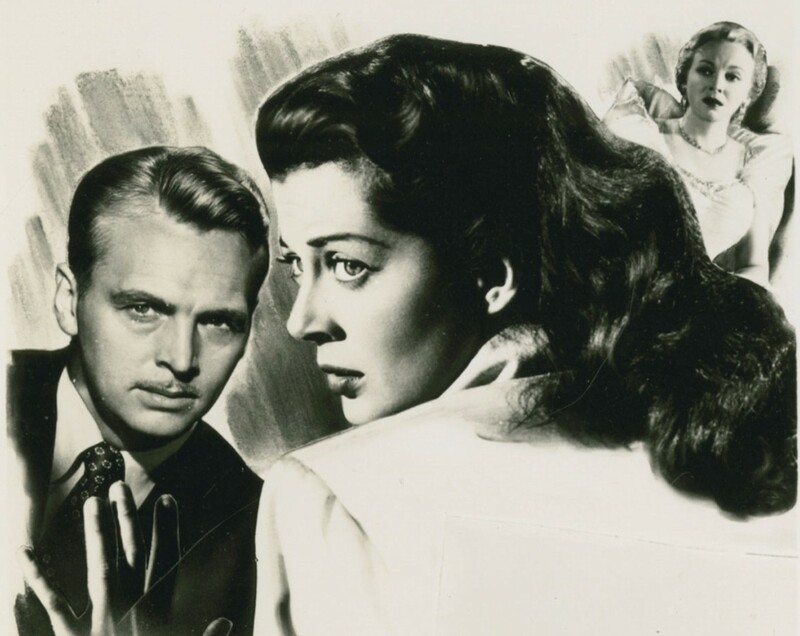 But there were others: Val Lewton’s The Leopard Man (1943, from Black Alibi), Phantom Lady (’43), Deadline at Dawn (’46), The Window (’49, from “The Boy Cried Murder”). More recently, too: Francois Truffaut’s The Bride Wore Black (’68) and Mississippi Mermaid (’69, from Waltz into Darkness), Mrs. Winterbourne (’96, from I Married a Dead Man), Original Sin (2001, Waltz into Darkness again). 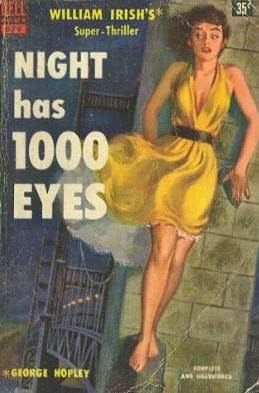 Night Has a Thousand Eyes was published in 1945 under one of Woolrich’s pen names, George Hopley (his two middle names); later, in this ’50s-vintage paperback, under his other one, William Irish. But in 1948, when Paramount and director John Farrow filmed the novel, the screen credits named Cornell Woolrich as the novel’s author. If Woolrich bothered to see the movie (and my guess is he simply took the money and ran — or rather, stayed home; he doesn’t seem to have gotten out much in those days), he might have had trouble recognizing it. The novel is told from the alternating viewpoints of its two central characters: New York police detective Fred Shawn and heiress Jean Reid, whom he saves from a suicidal jump off a bridge one night while walking home from work. Shattered and timorous, Jean recounts the events that have driven her to such a desperate pass. Jean and her wealthy widowed father Harlan Reid were happy and secure until some weeks before, when he planned to fly west to San Francisco and back on a business trip. Overhearing the plans, a servant girl blurts out to Jean that her father mustn’t fly back; a “friend” has told her that the plane will crash. Jean tries to dismiss the idea, but her sense of dread grows by the hour, and she is devastated when the plane does indeed go down in Colorado. Seeking answers, the grieving Jean tries to meet her maid’s friend but he refuses, sending word that she should go home; she’ll see her father again. At home she finds a telegram: her father missed his flight and is unharmed; he’ll be coming home by train. The Reids eventually meet the mysterious prophet: Jeremiah Tompkins, a shrunken, broken little man who disdains their gratitude, refuses money, and demands only to be left alone. Yet even as he rebuffs them, he speaks in riddles — and every cryptic remark is borne out by events that he could never have foreseen. Harlan Reid is hooked, returning to Tompkins time and again, seeking advice on business matters and always profiting by what he learns, and always offering payment which Tompkins always refuses. Finally Tompkins tells him that further advice is useless: Reid has only a few weeks to live. Unwilling to speak but unable to stop, Tompkins tells him the exact date and hour when he will meet his death “in the jaws of a lion.” The robust, confident Reid becomes a shocked, hollow shell of himself, waiting only to die. Jean, meanwhile, glimpsing a hostile, uncaring universe without free will, in which she and her father are trapped like insects in amber, has despaired and tried to kill herself, only to be rescued by Shawn. Shawn senses some subtle, diabolical scam afoot and persuades his superiors to launch an investigation in the few days remaining. What is Tompkins up to? Is he up to anything at all? The novel then becomes a blend of police procedures, as detectives try to trace Tompkins’ “predictions” to their roots, and Shawn and Jean’s vigil at the Reid estate. As the two seek to raise Harlan Reid’s spirits and head off the perplexing prophecies, their forlorn efforts take on the futile aura of a death watch. It’s no spoiler to say that, along with a few unexpected turns, events work out precisely as Tompkins said they would. The novel ends on a note of trembling hope, but with the characters sensing that they are playthings in the hands of unbreakable fate, and that they’d have been far happier without that glimpse of the abyss. Even Woolrich’s most admiring fans know that elegant plots were not among his strengths, and much of Night strains credulity; indeed, the supernatural element is often more credible than the ordinary goings-on (which may have been the whole idea). Nor was he much of a stylist; he often overwrites like a man who gets a penny a word and is determined to squeeze every cent he can out of his story. Sometimes his novel reads like the hardboiled Mickey Spillane parody “The Girl Hunters Ballet” in The Band Wagon, as funny unintentionally as Comden and Green were on purpose. Rather than plot or style, what Woolrich’s novel has is mood — in spades, and maybe even to a fault — the chilling sense of being in the grip of some insensate force and powerless to resist. If Woolrich did happen to swing by New York’s Paramount Theatre when the movie opened there in October 1948, he might have noticed that that mood is preserved on the screen, even as his entire story and most of his characters are jettisoned. Elements of the novel remain, recognizable but altered, as in a dream. The tormented oracle, of course. The opening scene of a young woman saved from suicide — only now her name is Jean Courtland (Gail Russell), and her rescuer isn’t a stranger but her fiance Elliott Carson (John Lund). The plane crash — only this time Jean’s father (Jerome Cowan) is on the plane and goes down with it. The police-procedural investigation by William Demarest as Lt. Shawn, the only surname to survive from the novel — only this time the aim is not to avert Jean’s father’s death, but her own. And as in the book, there are the cowardly servants deserting Jean, and treachery within the doomed tycoon’s circle of associates. Even the mysterious reference to a lion remains, and is similarly borne out. 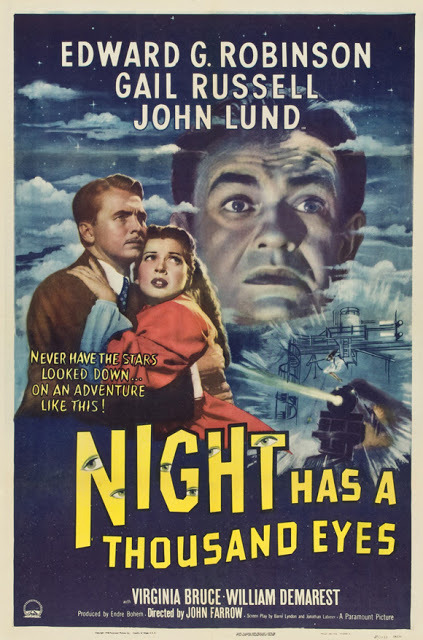 The screenplay of Night Has a Thousand Eyes is by Barre Lyndon and Jonathan Latimer, and for me there’s no getting around the fact that they made major improvements in Cornell Woolrich’s original. The story is simpler and more interesting — positioning Jean as the damsel in distress is a much smoother sell than asking us to worry about a broken old man giving up and sitting around waiting for death. Lyndon and Latimer’s biggest and most satisfying change is in the character of the psychic, the reason the story exists in the first place. Woolrich, with a typically heavy hand, gives us Jeremiah Tompkins (“Jeremiah”, yet! ), cursed and burdened his entire life with a “gift” he doesn’t understand or want and can’t control, crushed by it long before he meets Jean or her father. He’s given up. He’s a haunted zero. In the movie Tompkins becomes John Triton (Edward G. Robinson), a vaudeville and nightclub mentalist with a phony mind-reading act. Or rather, that’s what he was some twenty-odd years ago, as he describes things to us in flashback. As he plies his act in theaters and saloons from town to town, he finds himself — and he’s not even sure exactly when it started — getting genuine flashes, glimpses into the future: the winner in a horse race, the son of an audience member who is playing with matches at home and about to set fire to the house, an investment opportunity that will pay off. Triton has an additional connection with Jean Courtland supplied by Lyndon and Latimer: his partners in the act (Jerome Cowan and Virginia Bruce) are — will be — Jean’s parents, although the woman will die in childbirth and Jean will never know her. Triton sees this coming and thinks he can prevent it by running out on them, so he does (he still believes his visions are mutable and can be changed or forestalled). Courtland grows wealthy on the predictions he got from Triton before he disappeared, and for twenty years Jean has heard tales of Triton from her father, who believed the man was dead. Now Jean’s father himself is dead, and Triton knew it would happen. He knows as well that Jean too will meet…what?…death?…something…but he can’t…quite…make sense of his jumbled and fragmentary vision. Carson, Jean’s fiance, sees in Triton a carnival con-man running some kind of game to fleece a wealthy and vulnerable orphan, and he takes his concerns to the police. But Triton’s game, if there is a game, is a subtle one. He asks no money, does nothing illegal, and cooperates with the police one hundred percent. “He puts up a good show,” says a skeptical psychiatrist. What is this man up to? There is simply no end to the ways in which Night Has a Thousand Eyes is better than the novel it’s based on. The book may be a work of art that expresses the author’s nightmarish vision of an overpowering and inexorable universe (though I have my doubts on that score), but the movie was made by craftsmen who had the story sense (Barre Lyndon and Jonathan Latimer) and fluid style (John Farrow) that Cornell Woolrich lacked. In John Triton, the movie has a protagonist more complex, dramatic and interesting than the cringing troll Tompkins. Triton is a true Cassandra, a prophet fated to be disbelieved — not because people think he’s mad, but because they think he’s too sane, a slick and calculating huckster with a smooth line of patter. Which, once upon a time, he was. In addition, and perhaps more important, the movie has Edward G. Robinson. Robinson once said of himself, “Some people have youth, some have beauty — I have menace.” In one of his other 1948 pictures, Key Largo, he menaced Bogart, Bacall, Lionel Barrymore, Claire Trevor and anyone else who entered a room with him. Billy Wilder used that menace to great effect in Double Indemnity, where Robinson played, in fact, a good man who (without knowing it) menaced the picture’s protagonist and actual villain, perennial nice guy Fred MacMurray. In Night Has a Thousand Eyes Robinson’s menace is turned in on itself, a serpent eating its tail for so long it’s hard to tell where the serpent ends and the tail begins, or what is eating whom. Triton can’t un-see his visions, and he knows that trying to change events will make them happen, but he can’t keep himself from trying anymore than he can keep them from happening. In the end we can’t decide whether Triton embraces his “gift” or surrenders to it. Neither, perhaps, can he. We need a good professional DVD of Night Has a Thousand Eyes. The nocturnal motif of the title, the looming sense of prying, encroaching darkness, plays out in the relentless charcoal shadows strewn across the frame by Farrow and cinematographer John F. Seitz (I discussed this great cameraman in my essay on director Rex Ingram), and without a proper transfer elements of their images can be (and no doubt have been) lost in the murk of careless reproduction. Still, even in the gray-market renditions currently available, this is a sinister and unsettling movie in the best sense of the phrase, one that seems to have a foot in two different worlds — one the world we live in, the other a world that just may have its foot in us. 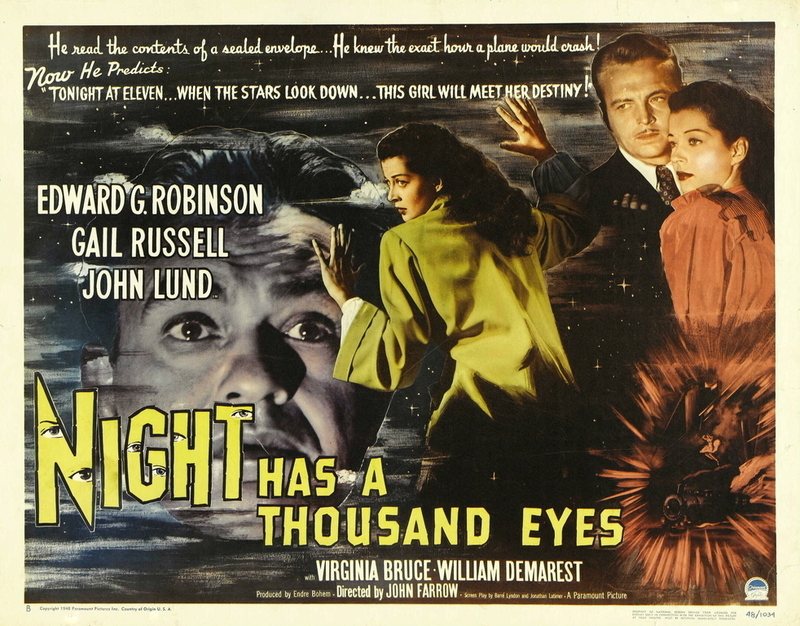 Night Has a Thousand Eyes is a specimen of a rare subgenre: supernatural noir. There aren’t many examples of that; parapsychology, the “spirit world”, and such things are not to be easily grafted onto the gritty, cynical urban landscapes of movies like Laura and Double Indemnity. 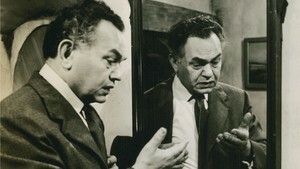 But John Farrow, Jonathan Latimer and producer Endre Bohem would do it again the following year in their next picture together, just a few months after finishing this. The result would be a neglected classic — forgotten now but, once seen, unforgettable. I’ll write about that one next time. Jim, I've been wanting to catch up with THE NIGHT HAS A THOUSAND EYES for some time, and your fascinating in-depth review has only made me even more eager to see it! Cornell Woolrich's prose style didn't always make sense, but it was chock full of atmosphere and foreboding. (And don't get me started on his shabby treatment of his unsuspecting wife!) Most of the film adaptations I've seen of Woolrich's stories were better than the novels/stories because the screenwriters kept the atmosphere and foreboding while tightening up the plots and enriching the characterizations. And how can you go wrong with folks like Edward G. Robinson and Gail Russell in the cast? Terrific review! Dorian, Night Has a Thousand Eyes is another one that's right up your alley. I long for the day Universal or TCM gives us a clean copy, with full justice to Seitz's ultra noir cinematography. Until that time, Loving the Classics's copy will fill the bill.